13.04.2016. Twenty-eight apprentices have completed their training at the Friedhelm Loh Group, and now have the skills they need for an increasingly digitized business world. For their final projects, the apprentices improved the performance of robots, developed methods to increase productivity and made digital processes more efficient. They were praised by both the head of the training program and top executives of the family-owned company, which is headquartered in Herborn, Germany. Mechatronics expert Daniel Grebe recently completed his training program at the same time as 27 others. The apprenticeships transfer a variety of skills, for example in technology, business and IT. He discovered at an early stage that industrial robots can, at times, be surprisingly slow and inefficient. In his final project, Grebe drew on his creativity and patience to address this issue. The focus of his attention was a horizontal welding unit. This now operates ten seconds faster per cycle and travels a shorter distance from one product to the next, increasing the manufacturing plant’s overall productivity. As Head of Training Matthias Hecker states: “It was a great result. A great deal of learning, planning and dedication went into this project. It was a real challenge, resolved in an outstanding way.” The apprenticeship program is of significant benefit to the Friedhelm Loh Group – not least as the graduates have a thorough understanding of processes and practices in the Group’s various subsidiaries. 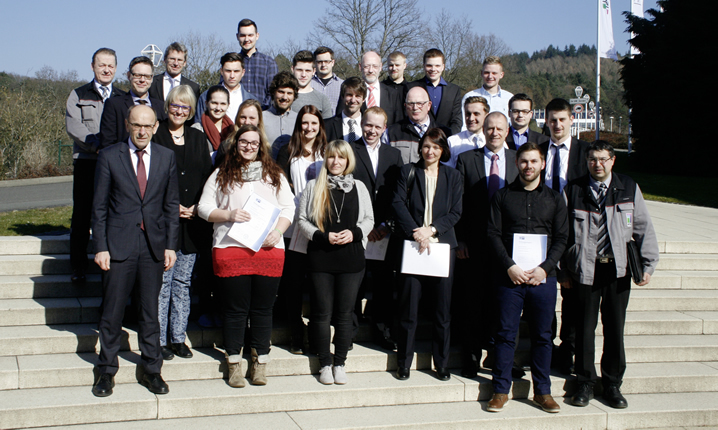 Twenty-three of the 28 apprentices were offered full-time positions with Rittal, Loh Services, Stahlo and Eplan. Around 200 apprentices train and work in the Friedhelm Loh Group at any one time. Subjects of study include industrial enclosures, energy-efficient climate control and man-machine communication within the scope of the fourth industrial revolution. Early assumption of responsibility plays an important role. Some apprentices attend shows such as CeBIT and the Hanover industrial trade fair (Hannover Messe). Others independently manage “companies within the company” – entities run by apprentices themselves, and featuring exotic names such Big Little Rittal and Ri2Youth. Typical tasks include managing vehicle fleets, ordering office supplies, processing orders and interacting with customer contacts at electrical and general engineering companies.“ “Acquiring an entrepreneurial mindset plays a major role,” says Tina Pfeiffer-Busch, Training Coordinator at the Friedhelm Loh Group. Those who perform exceptionally well are given the chance to gain insights in a more international environment. They acquire experience outside of Germany, join new teams, and discover the ins and outs of other national markets. This is an exciting opportunity, and gives them a better understanding of how people within our Group collaborate,” explains Hecker. Hecker advised the apprentices: “Digitization is drastically changing the work environment. Your training has given you solid foundations on which you can now continue to build. Going forward, embrace opportunities for additional training. Stay on the ball.” He added that solid skills are the key to success for both employees and employers. Image: Twenty-eight apprentices have completed their training, acquiring skills in technology, business and IT. 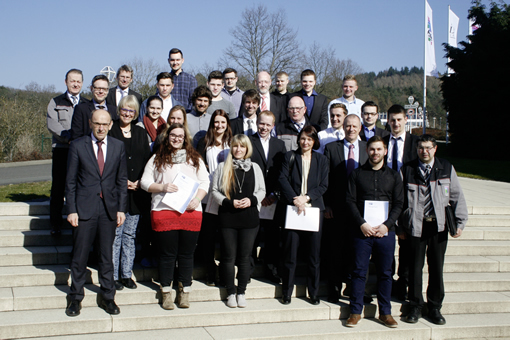 Michael Weiher (front row, left), Managing Director, International Production, Rittal; Matthias Hecker (second row, second from right), Head of Training at Rittal; and Tina Pfeiffer-Busch (second row, left), Training Coordinator at the Friedhelm Loh Group, presented graduates with certificates.